Ender’s Game as many of you know is one of my all time book series E.V.E.R. I am a crazy fan of Ender’s Game and The Shadow Series spin offs, HUGE. 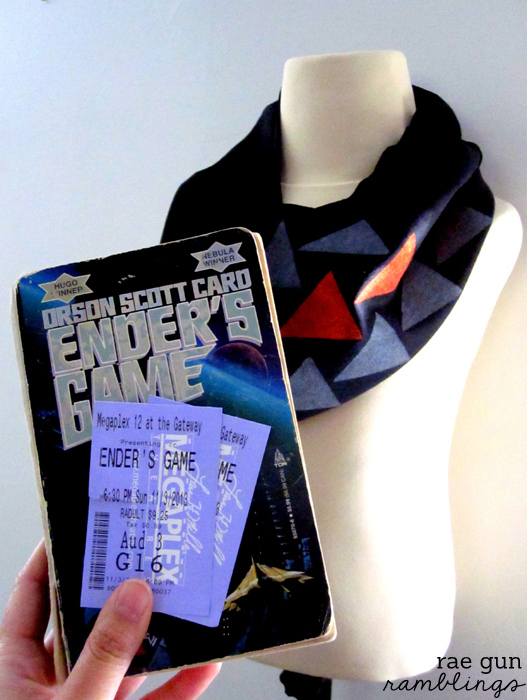 So to say that I was excited for the Ender’s Game movie would be a slight understatement. I have been wanting and waiting for this movie for over 15 years. So try as I might I couldn’t not have high expectations. 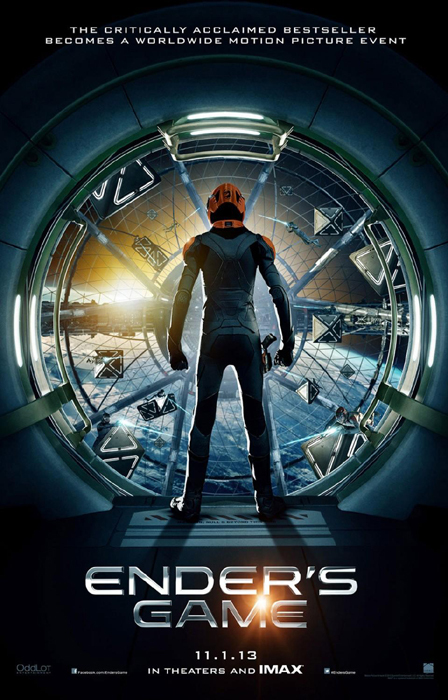 I’ve been known in the past to have mild book to movie meltdowns so I try to squelch my hopes, but after attending the Ender’s Game session at the Salt Lake Comic Con (in September) and hearing so many people that worked on and had seen the movie just rave about it I let myself have high hopes. I was not disappointed. I thought it was great. Really this was a SUPER hard book to bring to the big screen and as I think back on it the only thing I think that could have made it better was if it was longer and if they could have found younger actors to pull off the parts. I’m thinking neither of these are real options when it comes to making a movie though. 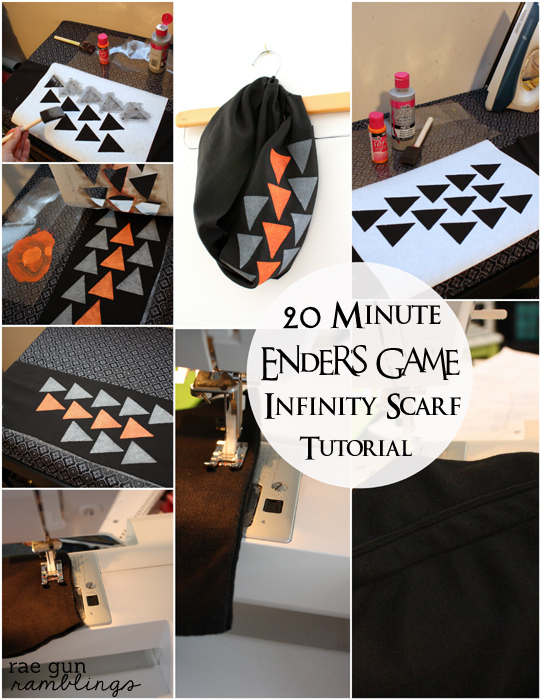 To celebrate the happiness that is this movie I made myself an Ender’s Game Scarf. I have a tutorial but before that let me share a few thoughts on the movie. As much as I thought that the movie did the book justice while keeping good pacing and having it be all around entertaining it made me appreciate the book even more. The characters and the complexity of the the story lines are SO much richer in the book. They did change a few things but unlike other book movies these changes all made sense to make the adaptation work. For example they had Bean be a part of Ender’s launch group. The book lover in me raised an eyebrow when Bean introduced himself on the shuttle but then I quickly moved on because they needed that time to develop his character. I used orange and gray since those are the colors of Dragon Army the army that Ender commanded in Battle School. The arrows also are symbolic Ender’s battle room quote “the enemy’s gate is down”. I made my stencil on my Cricut by lining up a bunch of triangles in cricut craft room and then cutting the design on freezer paper but the design is so easy that you could do this with an exacto knife as well. Once you have your stencil lay the freezer paper shinny side down on your fabric and iron so that the stencil sticks to your fabric. Using fabric paint (I LOVE the Tulip brand soft fabric paint) blot on. 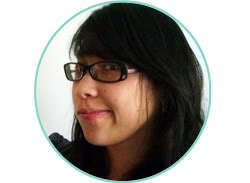 It’s better to use a blotting motion rather than a brushing motion. Let sit for a few minutes (I just put stuff away clean my brushes and then continue). Then pull off the freezer paper taking care not to touch the wet paint or touch the painted stencil to anything while you remove it. 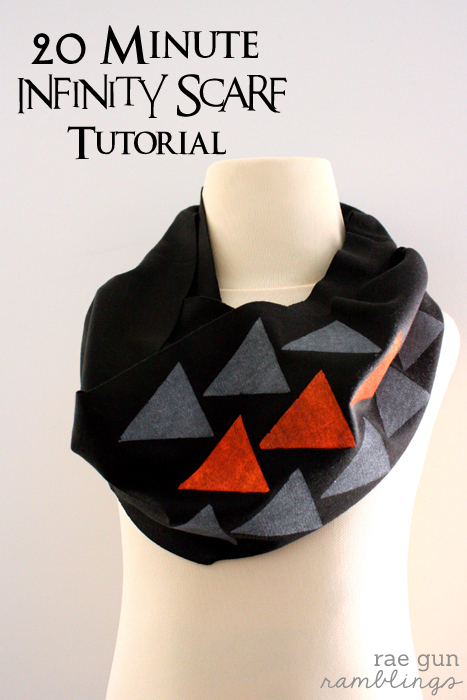 Make it into an infinity scarf by sewing a french seem into the short ends of the scarf. Do this by sewing the short ends together opening the seam and then folding it over the edge to sandwich the wrong side of the seam. Sew another seam enclosing the edge and then sew the resulting flap down. I have the exact same reactions to Bean, but I agreed! I think they did a great job of getting the feel for the movie even if I was sad about some things. The only change that bothered me was the characterization of Petra. I felt like the film depiction took a lot away from her. Still, 90% pleased with the film. We weren’t originally intending to go– after finding out about some of Card’s statements– but we figured he had already gotten his paycheck. Our theater in my very red state was nearly empty though. I am going to come still this scarf. mmmKay? I loved loved loved this movie too!! That scarf is cute. :) I like your cliffnotes statement – it’s so true! It was condensed but it got all the important things right. Awesome review. I still haven’t seen the movie – I need to fix that this weekend! Love the scarf! Yes I agree you totally need to take care of that! 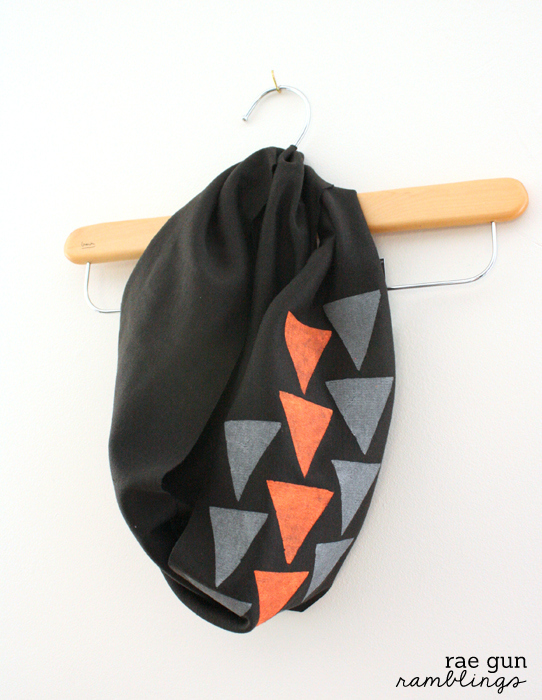 I love this scarf. I just pinned it! I always love your book posts. Awesome job. Every time.